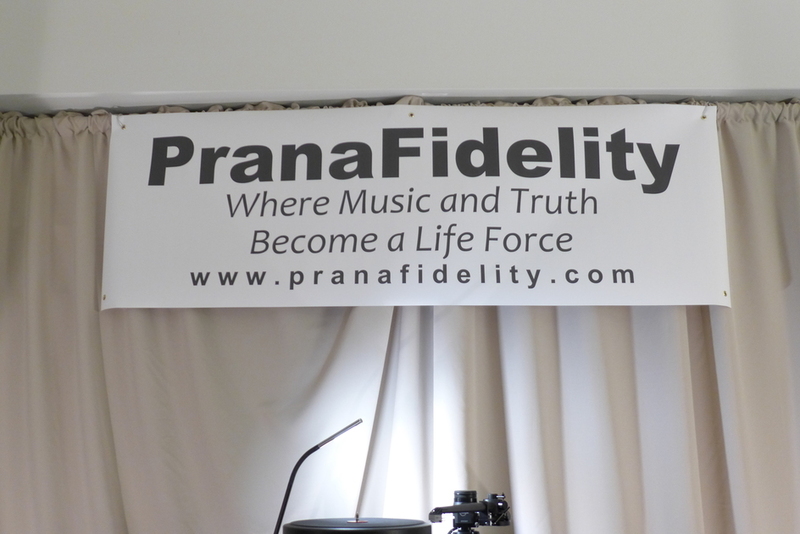 Some say the first L.A. audio show in recent times was a success. Crowds were more than respectable for a first outing, attendees had access to a bevy of gear and industry figures, and the venue was widely lauded for its location and facilities. Other exhibitors pointed to haphazard logistics and lengthy stretches when their rooms were empty. In truth, the ultimate success of this show won’t be known until next year—by then, the beloved Newport Beach show—which this year is taking place in Anaheim a mere three months from now and barely two weeks before RMAF—will also have occurred. In addition to a plague of equipment shipping and delivery delays, the L.A. show suffered one other teething pain: sound. Exhibitors were befuddled by the rooms, whose shape and dimensions proved far from ideal. The coffered ceilings and slick walls didn’t help. Mostly my colleagues and I heard hard, shouty sound in the highs, accompanied by iffy bass. But good sound was possible; not due to better rooms but because some exhibitors figured out how to tame their space. Over time, this positive outcome will become more prevalent. Heck, if exhibitors can figure out how to produce good sound at Munich’s glass-walled MOC, they can undoubtedly learn to do so at the Sheraton Gateway. Speaking of Munich, its timing and position as the world’s most important audio show had a clear impact on L.A.. With most of the industry having spilled its major-announcement beans in Germany, there was little left in the way of news at L.A. That didn’t bother attendees, of course, but it means that you won’t read as many “Auspicious Debuts” as usual. On the other hand, there were a plethora of U.S. debuts. Ultimately, the new L.A. show had just enough traffic, industry participation, and oases of good sound to be considered a successful first-time outing. Perhaps most importantly, it foreshadowed what a powerhouse it could be if the industry consolidates around it in this important market. Despite this show coming hard on the heels of Munich, where most of the industry made new product announcements, there were several first-time introductions in L.A. that are well worth detailing. The show also offered the first exhibit on American soil of many of those Munich stars. Let’s start with the brand-new products. I couldn’t have been more taken with Astell&Kern’s new flagship portable player, the SP1000. At $3500, the newcomer takes the place and price-point of the previous flagship, the superb AK380. That model will continue in the lineup at the reduced price of $3000. The SP1000 is the largest portable player I’ve ever seen; it’s the size of an iPhone 7 Plus or Galaxy S8+. Like those devices, the player’s screen is over 5”, which dwarfs A&K’s previous models and those of the competition. One area where the new A&K differs from the aforementioned phones is weight. Flagship phones make a point of being light, but the SP1000 comes in your choice of a solid billet of copper or a similar slab of stainless steel. This player is hefty. I asked A&K president Owen Kwon if the SP1000 could still reasonably be called “portable”. He indicated that a substantial subset of A&K customers had indicated that, like a fine watch, they wanted their player to exude gravitas and quality. The SP1000 certainly does that. But the SP1000 isn’t merely an AK380 with a larger screen. There’s more DSP power inside, which Kwon says enables the unit to present a quieter background. Feature-wise, the SP1000 sports a USB-C port with fast-charge capability. Its larger size also translates into a bigger battery, so the player can now run continuously for up to twelve hours. I’ll be getting my hands on one of these beauties and will report on its sound and practicality. L.A. exposed me to two brands I’d never before encountered: Aqua Hi-Fi and Sound Galleries. The former was giving the Aqua Formula DAC ($14k) its world premiere. The Formula is among that rare breed of DAC that eschews off-the-shelf chipsets, opting instead for discrete circuitry. In L.A., the Formula was paired with the Sound Galleries SGM 2015 music server ($16k), which has the ability to upsample its output to the optimal resolution for the attached DAC. Playing through Audio Research electronics (ARC had a particularly good show, showing up in many of the best-sounding rooms) and YG Carmel 2’s (I love these speakers), the sound was warm and lovely. 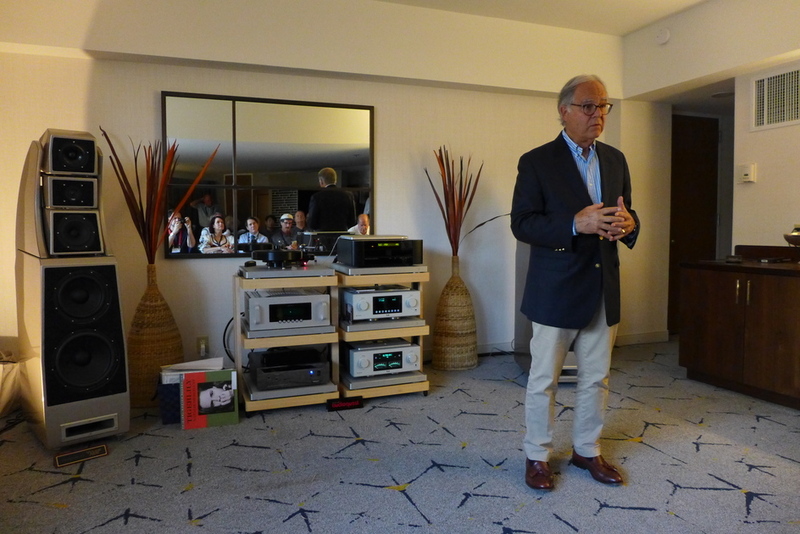 The entire exhibit was presented by La Jolla retailer Alma Audio, who had three rooms at the show. Ayon chose L.A. for not one but three major product announcements, including its new flagship player, the CD-35 Signature Edition ($12,500). Although the model name says “CD”, the player also supports SACD and is a full-fledged DAC. In the latter mode, the CD-35 has both BNC and USB inputs for PCM and DSD support. The built-in analog linestage is tube, Class A, and offers both single-ended and balanced outs. Glass nerds, note that the tube complement is four 6H30s and four 6SJ7s. Things get even more interesting when you consider that the CD-35 supports analog inputs; these forward signals directly to the analog linestage, passing only through the equally analog volume control. The last thing I’ll say about this versatile player, apart from how it sounds, is that its top-loading form factor is truly a thing of beauty. 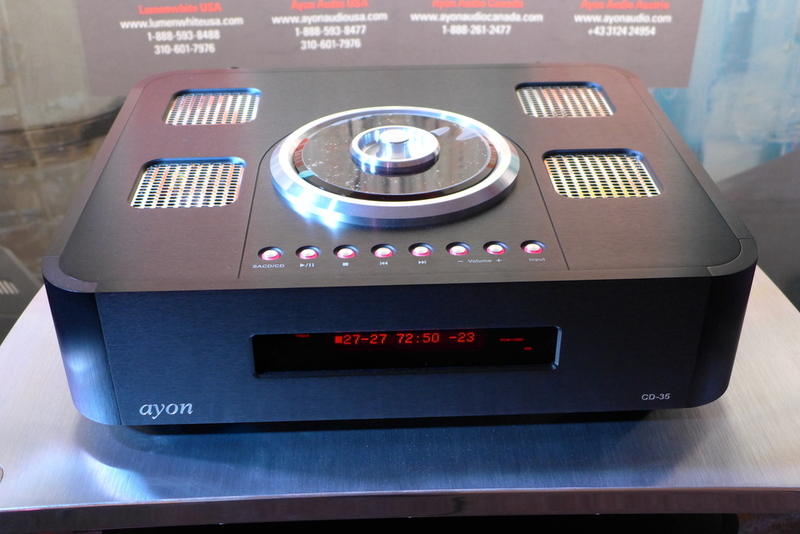 And if you’re taken by those looks and don’t need the DAC or linestage modules, Ayon can provide its second newly launched model, the CD-T ($6100). The CD-T is a pure transport intended to be run into the third new product, the S-10 streamer ($6700). The S-10 features the same tube linestage as the CD-35. Driving the LumenWhite speakers through Orthos XS Gen 4 amps, the new Ayon components produced an amazingly vibrant sound with phenomenal imaging. 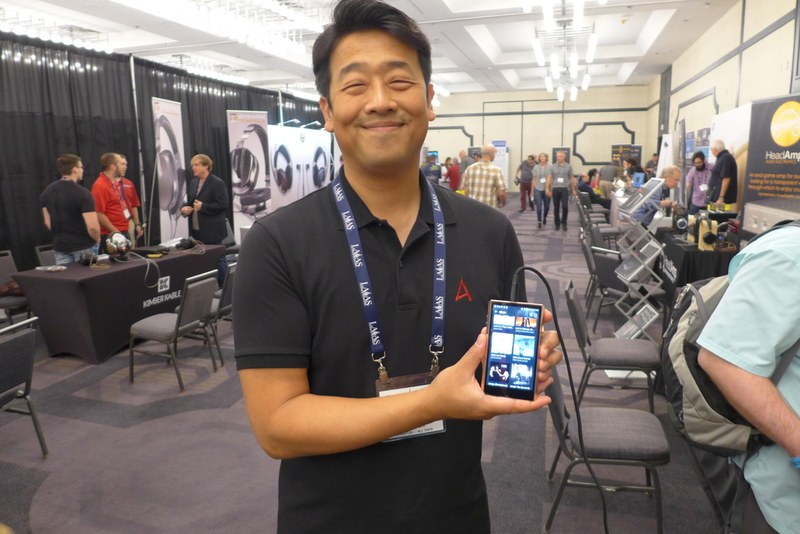 Streaming specialist Auralic was showing off its brand-new Polaris. This $3500 wireless server supports streaming, of course, but is also happy to act as a DAC, and even includes a phonostage! Like many new servers I saw, the Polaris doesn’t ship with a built-in drive. Rather, it more sensibly offers a slot into which the owner can insert an SSD of up to 1TB. If you have a NAS on your network, you’ll never need that slot. Otherwise, you’ll save a lot of money buying your own drive rather than paying to have a server maker charge for one—plus markup, plus installation. As I mentioned, L.A. denizens that didn’t happen to be in Munich were the first Americans to see a slew of products introduced in Germany. Naim displayed its now-shipping Uniti Core music server ($2600). This clever device not only aggregates all of your music—even songs on your phone—it continuously scans the Net for updates to your library’s metadata. A CD slot makes for easy, bit-perfect ripping. There are two SSD slots. While the Uniti Core doesn’t support Roon, its interface is very Roon-like. MQA is “under serious consideration” (apparently those licenses aren’t cheap) and may be added later via a software update. Not new but new to me was Musical Fidelity’s NuVista CD player ($10k). 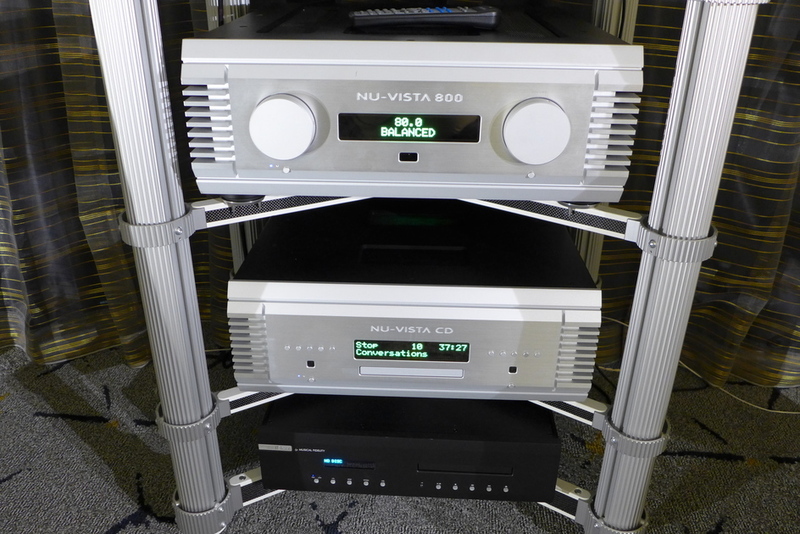 In style, apparent build-quality and pricing, the NuVista player, along with the matching NuVista 800 integrated amp ($12k) reminded me strongly of T+A. However, the similarities end there, as NuVista prides itself on its use of the nuvistor tube, known for its extended life and low levels of microphonics. The resulting sound was highly inviting. MSB gave the U.S. its first glimpse of the Reference DAC, described by Robert in his Munich report. The MSB’s base price of $39,500 can balloon, Porsche-like, to $65,000 when fully optioned. That wasn’t the most mind-boggling price I encountered at the show (for which, see my “Most Coveted Product”), but it came close. So I challenged MSB to explain how a DAC could justify such a lofty price. The answer, I must admit, was pretty compelling—at least from a technical perspective. For instance, MSB uses aerospace-grade resistors and builds its own clock module. Even the front panel display is built in-house to avoid the noise inherent in off-the-shelf options. The ladder DACs—there are eight within the Reference—are very expensive to build, but MSB feels they reduce errors and noise. Running multiples in parallel, as does the Reference, increases output to the point where no linestage is needed to drive power amps. The mother board runs at an astoundingly high 3.2MHz bandwidth. Finally, MSB is serious about supporting American manufacturing. Not only are all its products built in the U.S., the production equipment that builds those products is American-made. The Reference isn’t even MSB’s top-of-the-line, but it’s obviously a very serious and socially-conscious product. Other U.S. debuts included the DAC2x V2 and MA 1 V2 from EMM Labs. 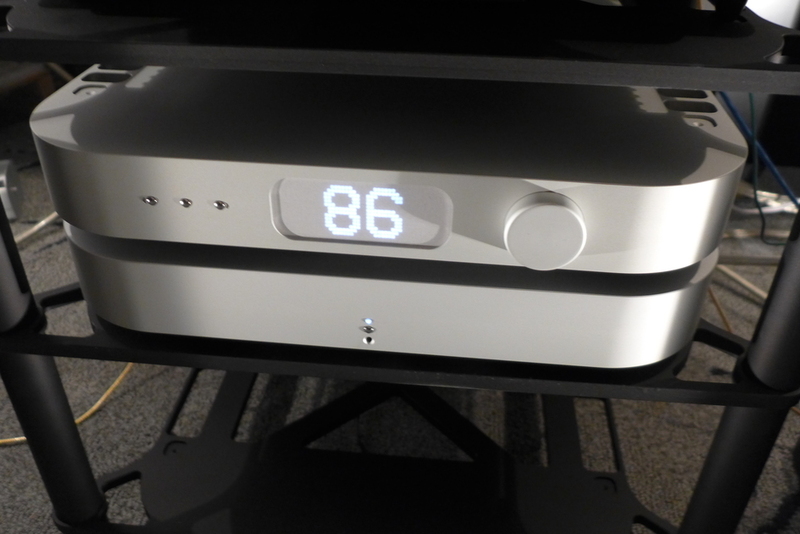 The first is a full-blown update of the DAC2x, though the price stands at $15k. Similarly, the MA 1’s price was not raised from the previous version’s $7k. At a somewhat lower price-point, Wyred 4 Sound showed its new MS music server connected to its new 10th Anniversary DAC-2v2SE. For $2-3k, depending on configuration, you get a ripper, Roon support, and an SSD slot. I also got the chance to see the AVM Ovation Series MP 8.2 player ($11k) that Robert Harley described in his Munich show report. To Robert’s description I’ll add that the normally-tube unit is available in an all solid-state version for $9k. Both versions include a TEAC CD drive, built-in streamer, four power supplies, and a modular daughter board for the ultimate in upgradeability. If physical media is no longer your bag, AVM also offers the similar SD 8.2 ($11k), which drops the MP 8.2’s drive system while upgrading other areas such as the linestage. The results were not what I expected. I had anticipated hearing primarily sonic differences—hopefully improvements—along the lines of more air, better spatiality, etc. Instead, to my surprise, what I heard were primarily musical differences. And they were definitely improvements. On track after track, both old and new, nuanced (Peter’s own classical recordings) and coarse (Daft Punk), and across a multitude of genres, I found the MQA-encoded material more expressive, more musically spellbinding. MQA made the artist’s dynamic inflections, for example, far more obvious, and it was much easier to follow individual lines within a cluster of instruments. At one point during an operatic aria, I wrote in my notes, “The sad sections are sadder.” Bob Stuart explained that since MQA significantly lowers the noise floor and removes digital time smearing, the brain has less processing work to do and can focus on the music. That pretty much sums up my experience. Overall, while analog had a very strong showing in L.A., digital continued to move forward in intriguing ways. Best Sound (cost no object): Two rooms shined brighter than all others. The first, a ballroom graced with the Vandersteen System Nine and ARC electronics, produced effortlessly good sound. Its advantage stemmed from the top-flight components, an all-night room-tuning session, and Shane Buettner’s Intervention Records lacquers, which were the best source at the show. The second great room was smaller and featured the Kharma DB9 speakers driven by massive Viola electronics. I always seem to prefer the sound of Kharma’s less monumental speakers, and the DB9 proved no exception. The sound in this room, sourced from the fabulous Burmester belt-drive CD player, was exquisitely lifelike, with unbridled dynamics and realistic tonality. Best Sound (for the money): Andrew Jones’ new floorstanding Elac Adante speakers ($5k) paired with eminently affordable Elac Alchemy electronics produced astounding bass and the most natural imaging of the show. Most Significant Introduction: The A&K SP1000 may herald a new form factor for portable players—one that emphasizes screen size and convenience over sheer portability. Most Significant Trend: CD is dead. Aside from a few outliers, most products with a CD slot or drawer were music servers with ripping capability. Servers and streaming are unquestionably digital’s future. Most Coveted Product: Sennheiser’s $55,000 Orpheus headphones. As you’d expect for that kind of money, the Orpheus sounded pretty darned good. Plus, they come with a matching DAC and amp.